Infused. Calendula Oil is an infusion of marigold flowers soaked in sunflower or similar oil, and this natural remedy has been used for centuries due to its renowned calming and soothing properties on the skin. Its healing properties are legendary. Infused Calendula Oil works miracles on dry and chapped hands that have been subjected to abuse whilst washing-up or gardening, and when used as an intensive skin care treatment it can be effective for reducing thread veins or broken veins on the face. When applied directly to the skin it helps to ease red, irritated and sensitive skin. 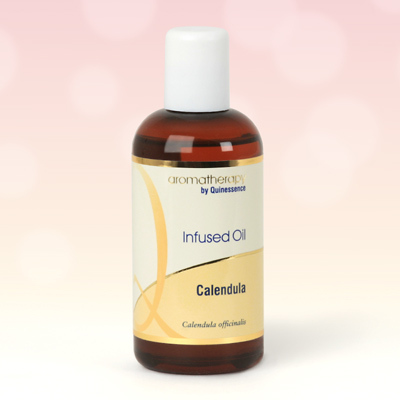 Calendula Oil can also help to balance excessively oily skin. Simply massage some oil into the face before retiring to bed and let it work its magic overnight. It also works wonders when you apply it to your legs to soothe dry and irritated skin after shaving. Use it in massage for maintaining joint mobility in later life. Like all infused oils, it can be used alone to ease skin conditions, or added to another carrier such as almond at 15% to 20% for massaging.